B Markovic and L Povoledo. Does Asia’s choice of exchange rate regime affect Europe’s exposure to US shocks? J C Cuestas and J Ordóñez. Unemployment and common smooth transition trends in Central and Eastern European Countries. A Kia. 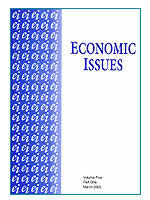 Developing a Market-Based Monetary Policy Transparency Index: Evidence from the United States. J Faria. Emotions, Happiness and Growth: Spinoza, James, and Ramsey. I Biefang-Frisancho Mariscal and P Howells. Interest Rate Pass-through and Risk. B Eichengreen, P Gupta, and R Kumar (eds). Emerging Giants: China and India in the World Economy. A Link and J Scott. Public Goods, Public Gains: Calculating the Social Benefits of Public R&D. Human Values; vol.II Poverty, Population, and Natural Resources. B Dutta (ed). Structural Econometrics — essays in Methodology and Applications in memory of Sanghamitra Das. G Fernández-de-Córdoba and L Torres. The Transitory VAT Cut in the UK: A Dynamic General Equilibrium Analysis. V Leone. From Property Companies to Real Estate Investment Trusts: The Impact of Economic and Property Factors on UK Listed Property Returns. A Abbott and G de Vita. Revisiting the Relationship between Inflation and Growth: A Note on the Role of Exchange Rate Regimes. P Rodgers. Overproduction of Yearling Thoroughbred Horses. G A Vamvoukas. The Tax-Spend Debate with an Application to the EU. R P F Holt, S Pressman and C L Spash (eds). Post Keynesian and Ecological Economics. Confronting Environmental Issues. Gregory Hess (ed). Guns and Butter: The Economic Causes and Consequences of Conflict. S R Khandker, G B Koolwal, and H A Samad. Handbook on Impact Evaluation: Quantitative Methods and Practice. Sebastian Berger (ed). The Foundations of Non-Equilibrium in Economics: The Principle of Circular and Cumulative Causation. David Utting (ed). Contemporary Social Evils.